The Eklutna Hydroelectric Project tailrace is located approximately 34 miles northeast of Anchorage near Mile 3.5 of the Old Glenn Highway. The site provides a recreational fishery that was originally supported by coho, sockeye, and chum salmon returning to the Cook Inlet Aquaculture Association's (CIAA) hatchery located at the head of the tailrace. The private nonprofit hatchery was operational from 1981 through 1998. 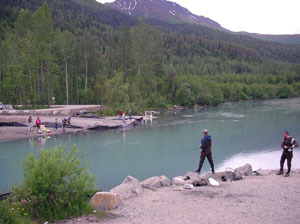 The sport fishery is confined to the approximately one-half mile long tailrace which extends from the Old Glenn Highway downstream to its confluence with the Knik River. Currently, the fishery is supported by hatchery coho and chinook salmon that are reared at the ADF&G Fort Richardson Hatchery and released into the tailrace. Coho salmon smolts have been stocked into the tailrace annually since 1998. Chinook salmon smolts were first stocked in May 2002, which has provided a chinook salmon fishery that began in the spring of 2004. 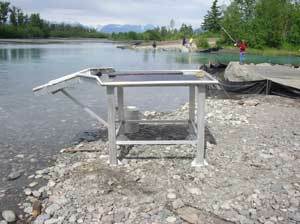 Salmon originating from the drainages of the Knik and Matanuska rivers are also harvested at the confluence of the tailrace and the Knik River. 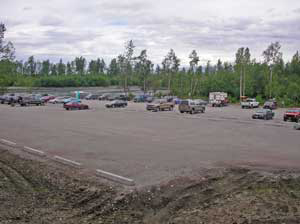 Prior to this project the site consisted of several undeveloped, single lane, rough roads to a small parking area at the mouth of the tailrace, unimproved pedestrian trails, and a small parking lot at the head of the tailrace located within the Old Glenn Highway right of way. The area between the highway and primary parking area at he mouth of the tailrace was heavily wooded and brushy, which encouraged squatter camps and vandalism of ADF&G-funded porta-potties, dumpsters, and signs. Given the poor, unimproved access to the site, it was difficult to get Alaska State Troopers or State Park Rangers to patrol the area. The appearance of a Google Maps link is not an Alaska Department of Fish and Game recommendation for or implied endorsement of Google Maps. Please also be aware that the provided latitude and longitude coordinates are approximations and are not intended for navigational purposes. 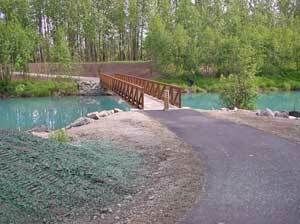 The objective of this project was to reroute and improve the public access road to the mouth of the tailrace, increase the size of the parking lot, and provide ADA accessible trails, fishing pads, a bridge (to provide convenient access to both sides of the tailrace), toilet screens and improved refuse receptacles. The project progressed smoothly and was completed in May 2005. The new entrance road and parking layout has provided safer access, better traffic flow, and increased parking capacity. The open site design and improved access has enabled law enforcement agencies to easily patrol the area. The trails, bridge and fishing pads provide easy, barrier free access to angling opportunities on both sides of the tailrace and the toilet screens and dumpster pad provide easier site maintenance.